For weeks, bitter accusations have been flying on Facebook pages, in emails and on phone calls between two groups organizing women’s marches in New York City. They each say they are fighting for women’s rights, but they are also fighting each other. Now the drama is playing Off Broadway, with two competing protests of the Trump administration in Manhattan happening on Saturday. In the beginning, the only march that existed in the city was organized by the Women’s March Alliance, a grass-roots organization separate from the Washington group. Katherine Siemionko, a former Goldman Sachs project manager with no prior community organizing experience, has been its director. Then in 2018, the New York chapter of the national group, Women’s March, founded by Agunda Okeyo and other black activists, began organizing in support of various causes and then planning their own 2019 march. But on a call in early October, Ms. Siemionko said, Ms. Sarsour was “threatening” and tried to wrest control of the New York protest from her group. But, Ms. Sarsour said Ms. Siemionko refused to cooperate with the Women’s March group and that they were only trying to make the Alliance more inclusive to the city’s immigrant and minority communities. “It’s not representative of the larger city,” Ms. Sarsour said in an interview. She instead asked for help from the New York Immigration Coalition, which oversees more than 200 community immigrant groups and of which she is a former board member. The coalition provided the money, equipment and staff for the rally. In January, the Immigration Coalition also urged the Alliance to merge marches. By then, Ms. Siemionko said, it was too late. 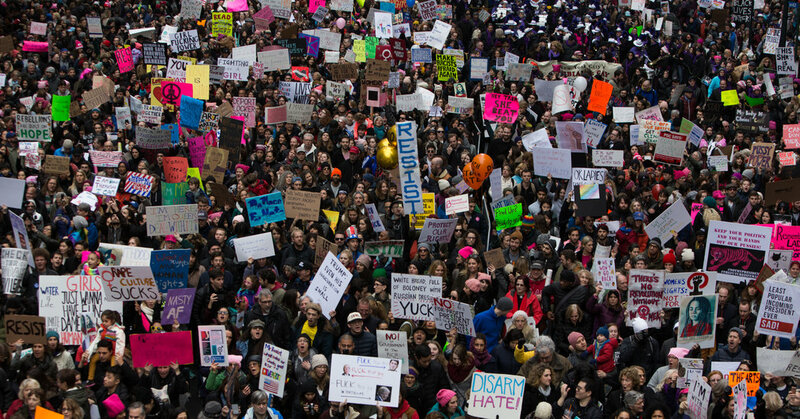 New York’s Jewish leaders, in particular, are conflicted because of the Women’s March NYC’s connections to the organization’s leaders in Washington. Ms. Sarsour’s resolute position defending the Boycott, Divestment and Sanctions movement in protest against Israel’s occupation of Palestine has proved problematic for some. But her co-leader, Tamika Mallory, helped push the divide as a result of her public support of Louis Farrakhan, the leader of the Nation of Islam, who has called Jews “termites.” Ms. Mallory has condemned bigotry and anti-Semitism but has not condemned Mr. Farrakhan personally. “If you are sympathetic to those who are prejudiced against Jews, we cannot stand with you,” Rabbi Ammiel Hirsch said in a sermon on Friday at Stephen Wise Free Synagogue on the Upper West Side. The synagogue was disassociating from the Women’s March group and any events affiliated with it; on Thursday, it will hold a panel discussion sponsored by Zioness, a women’s organization. She was part of a group of nine rabbis who signed a letter supporting Women’s March NYC, saying Ms. Sarsour and Ms. Mallory “have taken meaningful steps” to be more welcoming and inclusive to Jewish women. “It’s upon us to recognize that, to own who we are, of all stripes and colors and ethnicities, we’re not choosing to exempt our white privilege at a time when so much is at stake,” Rabbi Sol said. Ms. Sarsour admitted the group was slow to address concerns of anti-Semitism and has since revamped its Unity Principles to include Jewish women. “There’s no hate there, at all,” she said, adding that she grew up in a Jewish neighborhood and embraced the community. Pointing to the large Jewish population in that neighborhood, Ms. Siemionko added that they would not have to travel on the Sabbath. She did not mention Jews living elsewhere in the city. An informal gathering of people with disabilities and their supporters will start at 2 p.m. in the main hall of Grand Central Terminal, sponsored by the activist group, Rise and Resist. Ms. Siemionko forcefully denied allegations that she was not being inclusive, sensitive or legally compliant to people with disabilities; she sent a cease and desist letter to Ms. Bartlett, who has cerebral palsy, to stop her social media attacks on her. She is supporting Women’s March NYC, having known Ms. Okeyo as a family friend for years. She said she respects the inclusive women’s rights platform that Women’s March NYC has produced, including legislative advocacy. Ms. Steinem will be a featured speaker. Her advice to people who are confused? The Women’s March Alliance will start its march at 11:15 a.m. at 62nd Street and Central Park West, where there will be a small, 8-by-8-foot stage. Gates open at 10 a.m. at 72nd Street and Central Park West. Unlike last year, when there were numerous lengthy speeches, only be 15 minutes of speakers will kick off the march, to be named later, and entertainment, including a Brazilian Women’s drum line and a Joan Rivers impersonator. The route will go across 59th Street to Sixth Avenue and finish at 44th Street at approximately 3 p.m. The Women’s March NYC, which does not have a permit to march, will host a “Women’s Unity Rally” at 11 a.m. in Foley Square, between the courts and 26 Federal Plaza, which houses immigration agencies. The square, a city park, will open at 10 a.m. for rally goers and will finish at approximately 2 p.m.